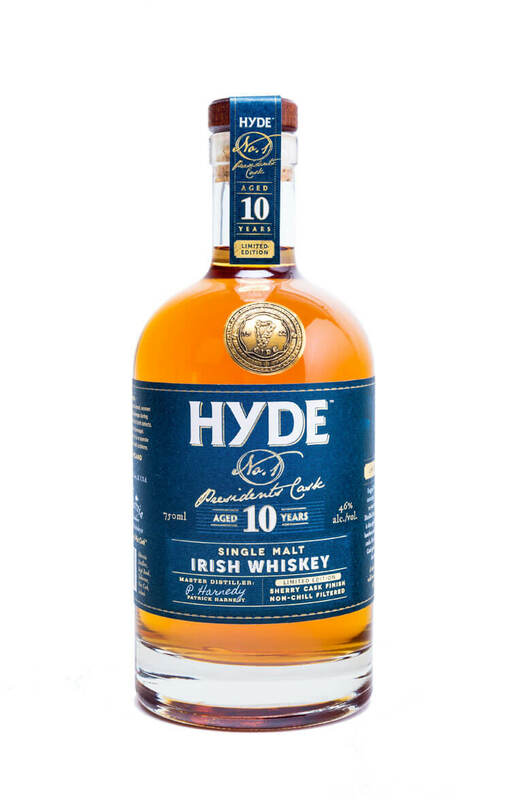 Hyde 10 Year Old single malt is a limited edition single malt that has been finished in Oloroso Sherry casks. This is a double distilled single malt that was initially matured in ex-Bourbon barrels. It is non-chilfiltered and bottled at 46%. This is named after Douglas Hyde, the first president of Ireland. Nose Lots of juicy fruit aromas, with hints of boiled sweet and pear drops. There’s also a woody note, similar to pencil shavings and workshops then some spice and cola notes. Palate Mouth-filling and viscous. Lots of juicy fruit to start with then evolves into dried vine fruits, dates and caramel flavours. Some warm, spicy oak adds a peppery note, which persists to the finish. Types of Barrel used for Aging Initially matured in ex-Bourbon barrels before a finishing period in Oloroso Sherry casks. Style Double distilled, unpeated single malt. Any Additional Information of Note Limited to just 5000 bottles in the first batch. Non-chilfiltered. The Hyde 1916 is a special celebratory bottle released on the anniversary year of the 1916 rising. T..